When selecting window coverings for your home, it is easy to get swept away in design choices like how to frame the window, invite light into a room or darken the space but there is a more beneficial consideration for parents. Cords and dangling pieces that are standard in many window treatments become deadly when children and pets are in the house unsupervised. October marks the National Window Covering Safety Month. This month is dedicated to urging homeowners to take action to protect their children, pets, and loved ones from the dangerous and deadly consequences of unsafe window treatments. Child safe window coverings are not always the first thought and we hope this video reenactment enlightens all parents and future parents. At 3 Blind Mice, we are advocates of child safety year-round. As experts in child safe motorized window shades, we offer a wide variety of cord-free window treatments to eliminate dangling cords, the largest threat to children and pets. The easiest way to protect your loved ones is by going cord-free. Every style of our corded window coverings can also be found in a safe, cordless fashion. This includes motorized blinds and shades, wood or vinyl shutters, and roller shades. 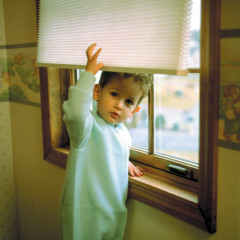 Replace your current window treatments with a child safe option to prevent dangerous situations for children and pets. Interested in more information on child safety? These are quick fixes but are not solutions, install cordless and/or battery powered roller shades for child safety as a long term solution. Replacing your current blinds with child-safe options is the perfect reason to upgrade, and going with cord-free varieties are the safest options. Safety doesn’t mean you have to overlook style! Select from many varieties and styles of window treatments to enhance your space. Transform your child’s bedroom and spark their imagination with Disney, NFL, and MLB screen-printed roller shades to show off their favorite characters or root, root, root, for their home teams! Safety should never be sacrificed. We pride ourselves in being a child-safe company and consistently work with our vendors to offer free child-safe upgrades to a number of their products, removing cost as a hindrance to selecting child-safe window coverings. Call us at 858.452.6100 to speak with one of our experienced designers and learn more about keeping your child safe when it comes to your window coverings or set up an appointment. You can also stop by our large window treatment showroom in San Diego to view our large selection of window treatments. I always tell my families about cordless options including motorization to avoid these types of tragedies.